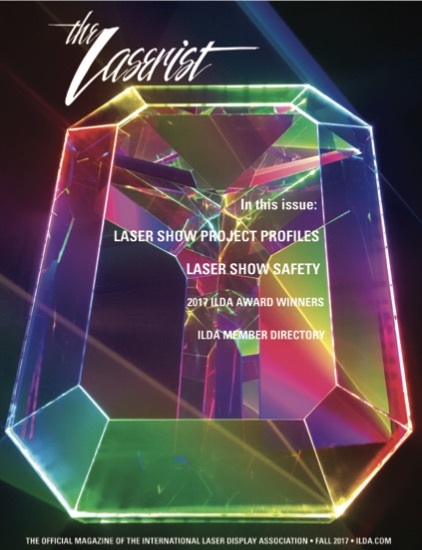 ILDA will be publishing The Laserist magazine, coming October 2018 in time for the October 15-21 LDI show in Las Vegas and the November 10-12 ILDA Conference in Montréal. The magazine will be produced in print (32 full-color pages) as well as an online version. Editorial material can include press releases, photos, articles — especially on technical subjects — and story suggestions. We cannot guarantee publication, but we will consider all submissions. Deadline for editorial submissions is September 20. Word count is 500-750 words per page depending on the size and number of any accompanying photos. To submit editorial material, contact us via email at ILDA. Editorial material is submitted to ILDA. Advertising provides a targeted way to reach laser show producers, persons buying laser show equipment and software, and those considering hiring laser show companies. Deadline for ad reservations is Sept 1; deadline for ad submission is Sept 20. To reserve ad space, click here for the publisher’s ad site. Ads are submitted to the publisher, EM Consulting. This is a unique opportunity to be in the only lasershow-specific magazine in the world! Reach clients, buyers and ILDA Members with the 2018 Laserist magazine. The Laserist is ILDA’s magazine. The most recent issue came out in early February 2019. 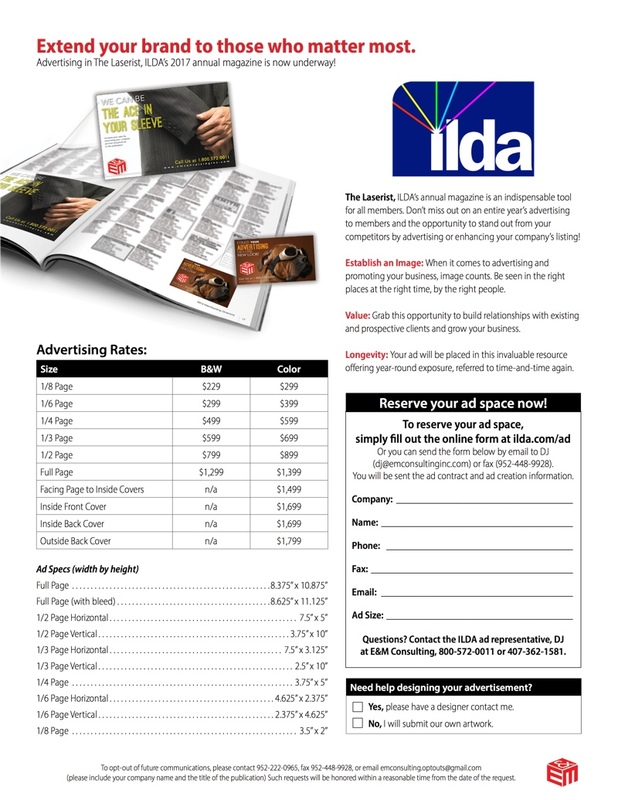 Copies were mailed to all ILDA Members with a mailing address in our database. Click on the cover image to download a PDF version of this issue. 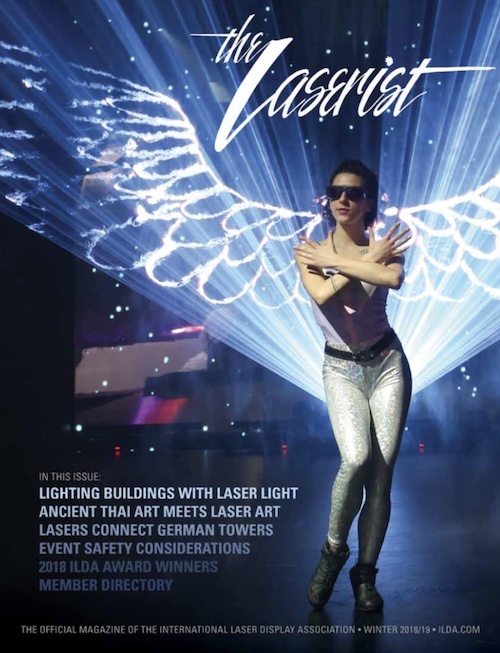 The November 2017 issue of The Laserist was distributed at the 2017 ILDA Conference in Bratislava, and at the 2017 LDI lighting trade show in Las Vegas. Copies were also mailed to all ILDA Members with a mailing address in our database. 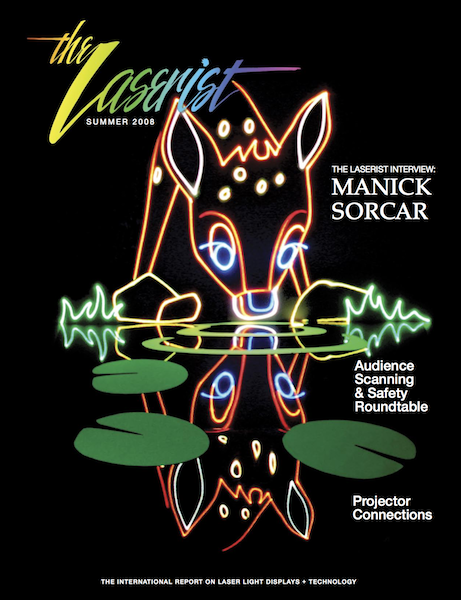 To see some past Laserist magazines and articles online, visit the Laserist page at ILDA’s old website. ILDA will be publishing The Laserist magazine, coming November 2017 in time for the ILDA Conference and the LDI show in Las Vegas. It will be produced in print (32 full-color pages) as well as an online version. Editorial material can include press releases, photos, articles — especially on technical subjects — and story suggestions. We cannot guarantee publication, but we will consider all submissions. Deadline for editorial submissions is September 1. Word count is 500-750 words per page depending on the size and number of any accompanying photos. To submit editorial material, contact us via email at ILDA. Editorial material is submitted to ILDA. Advertising provides a targeted way to reach laser show producers, persons buying laser show equipment and software, and those considering hiring laser show companies. Deadline for ad reservations is September 1; deadline for ad submission is September 15. To reserve ad space, click here for the publisher’s ad site. Ads are submitted to the publisher, EM Consulting. This is a unique opportunity to be in the only lasershow-specific magazine in the world! Reach clients, buyers and ILDA Members with the 2017 Laserist magazine. “Blow Your Mind” photo by Laser Show Design Inc.